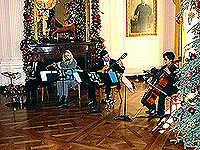 Left to Right - Performing in the East Room, in front of the Presidential Seal. 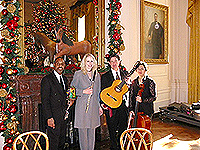 Guitarist and public radio host Tony Morris performed a private concert with guest musicians including flutist Renata Green, cellist Shu-Yi Scott, and percussionist James Fenner at the White House in Washington, D.C. on Monday, December 16, 2002 in the East Room of the White House. Due to increased security, the performance was not open to the general public, but was attended by White House staff and administration officials, including Dr. Eileen Mason, acting Director of the National Endowment for the Arts. 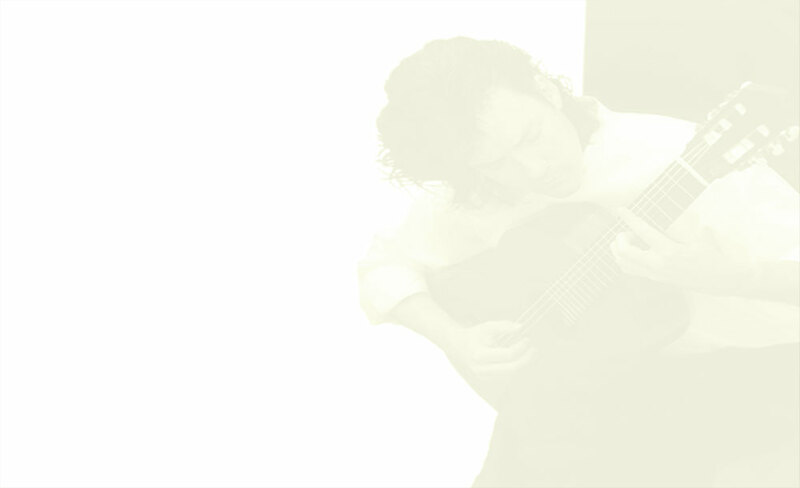 Tony Morris, who hosts the internationally-broadcast public radio program "Classical Guitar Alive! ", received the invitation to perform at White House invitation following his concert television taping at the Texas Governor's Mansion earlier this year.